Long-time friends, Chris Martenson and Adam Taggart, are advocates with us for investors transitioning out of paper assets and into REAL ASSETS. In fact, they asked us to spend some time educating investors about the practical steps for investing in real estate for security and profitability. As investors begin to move away from bubble markets looking for safer alternatives, we foresee money finding its way into real estate … for many good reasons. You can get ahead of the curve and position yourself to benefit from current market changes and future trends. So grab your friends (perhaps over a meal?) and …. Participate LIVE! 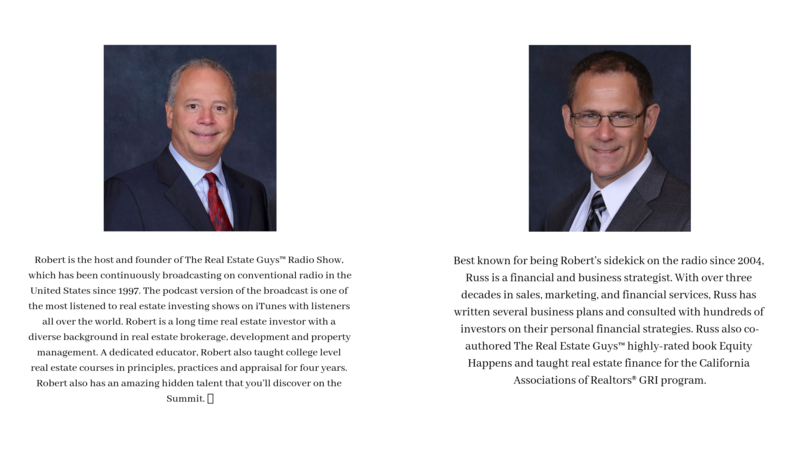 You’ll be able to ask your questions directly to Robert and Russ throughout the webinar. Can’t make the date? Not to worry. Everyone who registers will be able to watch the recorded replay. Now is the time to start educating yourself about real estate investing so that you are positioned to take action when the time is right. Participate LIVE to get your questions answered directly from Robert and Russ during the webinar. Remember, if you can’t make the live dates for each webinar … Everyone who registers will be able to watch the recorded replay! “I was very impressed with the information you gave us during today’s Real Estate Investment Webinar with Adam Taggart and Chris Martenson. Thanks for doing this, it was full of good information for someone like me who is just starting out in this.” – Andrew S.